Time flies. It’s hard to believe I have been home from Kenya and training with AYP for almost three months. I know the word is overused but my trip and experience were AWE-SOME. As in awe inspiring, challenging, exhilarating and generally life altering. It’s taken me these three months to begin to process what the trip meant/means for me. I would love to be able to say thank you and share some pictures and stories and dreams with you. On Sunday, August 13th from 12pm-2pm at Sweet Pea’s Studio in Chicago, come and join me for a community class. We’ll play some music, tell some stories, look at pictures and of course do some yoga! What goes better with stories and yoga?? How about chocolate chip cookies and milk? The class and cookies are totally free, open to all (kids welcome too). Come for part or all of our practice. 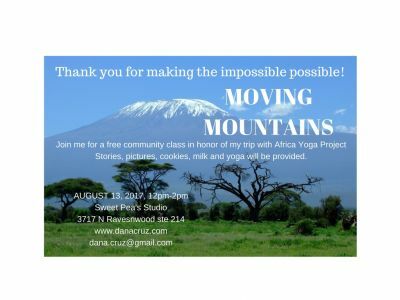 Asana starts at 1pm and any money/donations you would like to offer will go towards I Grow Chicago Peace House in Englewood. Who knew this trip to Kenya would connect me with yogis doing amazing work in Chicago? The folks at I grow are transforming their community and I am proud to be able to support them in their work at providing free, safe space and resources for anyone who comes their way.